Note the double write-protect notches ? Woo, a flippy-disk from the days when drives were single-sided ! I sort of really want to buy a floppy drive on ebay now and hook it up to my computer for absolutely no reason. 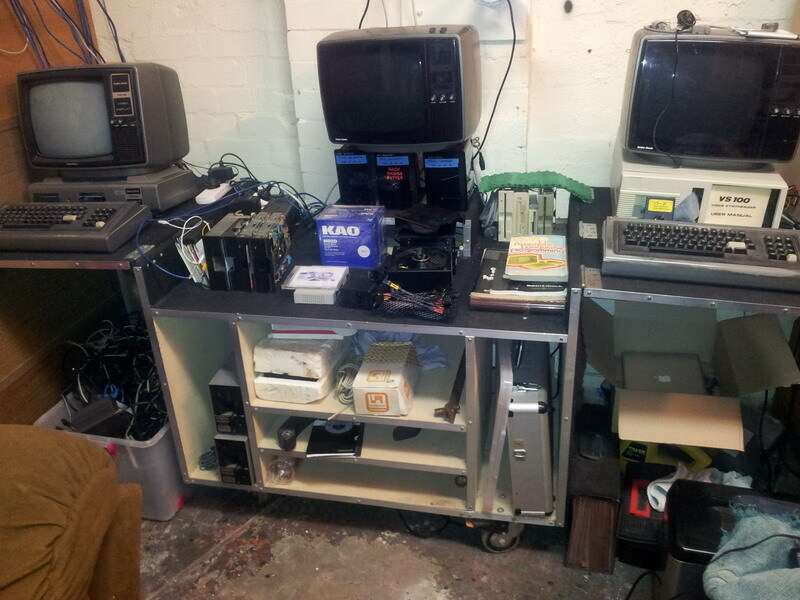 *9* of them in my Vintage Corner with the two TRS-80's there.. Who needs Super Computers ? From the Tandy 35 Track Single Sided Single Density 180k originals, up to "High Capacity" 80 Track Double Sided Double Density 800k monsters ! And if you are wondering where the 9th one is, its in that Polystyrene Box on the shelf. A very rare "Flippy Drive" with double write-protect and index-hole sensors so you can turn a standard disk over and use the other side without having to cut out the extra holes. It is amazing to see technology that was once cutting edge is now so far out of date. Compare a basic computer now to what was a basic computer five years ago. I once bought a high end gaming computer for my son, Alex. A couple of years later, it was inadequate and needed replacing. The next computer was not only more powerful, but also cheaper. I wonder how out of date the NBN will be by the time it reaches my area. The local paper has run stories for years about how there is no broadband available in our area. The capacity has been used up and they won't make any more because the NBN is coming. The NBN is first going to the people who already have adequate broadband. Meanwhile, there are businesses and households trying to get by on dial up in my area. By the time the cutting edge NBN reaches me, it will probably be outdated and replaced by something cheaper and more powerful. I find it entertaining that people think that the government should be building something like the NBN..
Im mean, c'mon, they cant even develop a properly working Train Ticket System..
What hope have they got of producing a reliable cutting edge computer network in an industry that moves faster than they can circulate memo's ? I recall a comment from an author.. "Watching the government try to keep up with technology is my favourite form of entertainment. its like they finally figured out how to regulate horses about the time that cars were introduced"
To me, it just looks like an excuse for politicians to get their hands on billions of dollars of public money to play their games with and look like they are performing some useful task for the community. What they *should* be doing is simply consulting with reputable proven industry leaders about what sort of regulatory structures should be put in place to stop anti competitive behaviour , writing a few rules to do with access to cable ducts and pits etc, and getting out of the way while people who know what they are doing get on with it. NOT Tel$tra/Floptus with their proven pathetic monopolistic practices - People like Simon Hacket, Mike Malone, the EFF and other groups that have shown they place the customers interests first. Telling media-content-industry lobbyists like AFACT and the **AA's to go get stuffed - Its not the place of government to hobble new communication mediums so the old school can keep raking in $ with their outdated content distribution models. If they had their way, Tape recorders, VCR's, CD Burners and the Internet would all have been banned. Computers at their fundamental level are digital bit-pattern copying/manipulation machines. From the oldest to the latest, the principle is exactly the same, only the processor speed and memory capacity changes. Some people/industries still want to try and make sure that ability of computers to reproduce and transmit information patterns works only in *their* favour. I didnt hear any industry crying when record-stamping machines appeared and made it possible for the media barons to punch out a million copies of a single artists performance so they could re-sell it over and over again without needing the artist to keep performing. They just didnt want that tech to get into the hands of the consumers. The government does not belong in the technology industry.. they dont understand it, cant keep up with it, and anything they touch turns into a inefficient political football to try and grab votes with, without regard to what its purpose actually is. They should just write some playing field rules, and get out of the arena. Actually the current NBN is fairly government hands off. The brief was build a network that will serve the needs of the public for the foreseeable future. Nobody said to NBNco use fibre or else. Fibre just happens to be the best suited to the job so that's what they are using where its practical. The end goal is to sell NBNco once its up and running. Hacket and everybody else are very pro NBN. No private company has the funds to put a big enough network in Australia to achieve a game changing end result. Boss of vodafone on the topic. What a load of 2GB spouted crap. There is nothing even on the horizon better than fibre. People have been looking for decades and there's not even anything in the theoretical realms of physics. Sure the GPON part could wind up getting replaced, the FAN's and customer equipment certainly will. Much like how now we have replaced the telephone with 56k modem with ADSL modems on the copper, the point is the part in the ground is what's hard and we have reached the physical limits on what copper can provide. With glass in the ground there should be no reason we can't have multi hundred gigabit connections without replacing the last mile. The oppositions plan is to spend ~$20Bn upgrading the stuff at each end of the copper then spend the next 15 years replacing *that* with fibre, you have just done the same job *twice*. Abbots broadband is 30% cheaper 10% faster to install and 97.5% slower at completion. (gbit Vs 25mbit). I must admit I haven't looked into the NBN. I just don't care. ADSL is fast enough for me. We have two computers running and generally don't get lag. I don't care if robowars.org loads in a fraction of a second or a fraction of a fraction of a second. I think it is all a huge waste of money. Sure, if everything else is going well, spend money on anything you like. Last night the news reported a three billion dollar cut to universities. We have seen cuts to all sorts of spending and increased taxes and we are still running deficit budgets. I think both sides of politics should stay out of it. For those that say the increased speed isn't needed this is me with my IT guy hat on. 100MBit is a critical enabling speed, once you hit that you are at the point where being at home is almost the same as being in the office. As your system administrator I can now let you login to the computers in the branch office with the same login as you use at the head office and have your desktop follow you with all your documents and email (and that funny cat picture that is your desktop background). You wont need crappy terminal services when you are at home, no more will it barf if you look at a website with flash animations you can bring your office desktop into your home PC. Plug a phone in next to it and you can work from home just like you do in the office. 25Mbit, is just not enough for that,even 50 isn't enough. These days, 100mbit is *just* enough. I'm going to hook your office up to the gigabit (1000mbit) that the nbn will be offering in 2015 so it can support 40 or so of you guys working from home and in outside offices. Just think of all those cars not on the road. The speed isn't for getting web pages faster right now, however when you start watching high def movies on demand (blue ray quality) or having 3d video conferences or who knows what, you just aren't going to be able to do that on a copper network. In addition, the direct cost to the government for the NBN is $700M, the GOVT is issuing bonds to pay for it, and the NBN will be sold to pay them back. Abbots NBN is now using the same funding model (that he spent 3 years slanging off) and comes with a direct cost to govt of $500M. Surely people who need extremely quick internet speeds at home already have it. Wasn't the home office a promise of the net decades ago? I don't want to watch TV on the net. There is very little I could be bothered watching on TV now. Why should my taxes be used so that someone else can watch Blue Ray movies on the next? There are people in my area who literally can't even download their emails during the day. A business man was interviewed in the local paper who had to do all of his internet work at 3 am. He couldn't get a connection through the day. If anyone sent him updated plans through the day, he had to wait until the next morning to open them. Surely it is better for him to have something usable right now than a gold plated system sometime in the future. Lets find out what it actually cost, how many people actually take it up, if there is profit in it and whether or not it can be sold for enough money to cover the loan. I hope I am wrong and it is not a huge waste of money, but this is the government. Just to be clear, I am not picking one system over the other. I don't want any government setting up the NBN. In addition, the direct cost to the government for the NBN is $700M, the GOVT is issuing bonds to pay for it, and the NBN will be sold to pay them back. We piss more cash into things like churches* / religious schools* with zero return (they don't pay taxes) and drug using sporting organisations* (who disgrace our country). I certainly know the health system could benefit from a decent network to support them. I'd finally be able to have interruption free video conversions with specialists instead of phone hook ups or 3+hr drives.